A few months ago I stopped eating nuts (almost drove me nuts) as part of an anti-inflammatory diet. One of the best parts of that experience, in addition to assuaging frequent migraines, was discovering sunflower seed butter. I now prefer it to peanut butter, hazelnut butter, and even almond butter. So far I have tasted three different brands from the store and found that Sunbutter is the sweetest (I inevitably added honey to the other two). 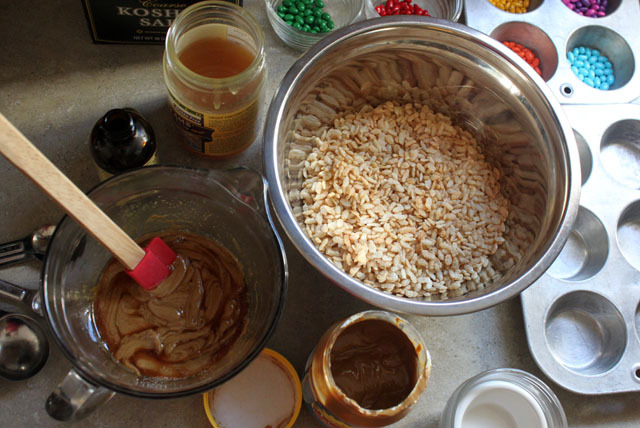 The following recipe is a combination of several allergen-free “rice crispy” recipes that are made with sunflower butter. This time I decided to mold them into cups that could be easily wrapped up in cupcake papers for individual treats. 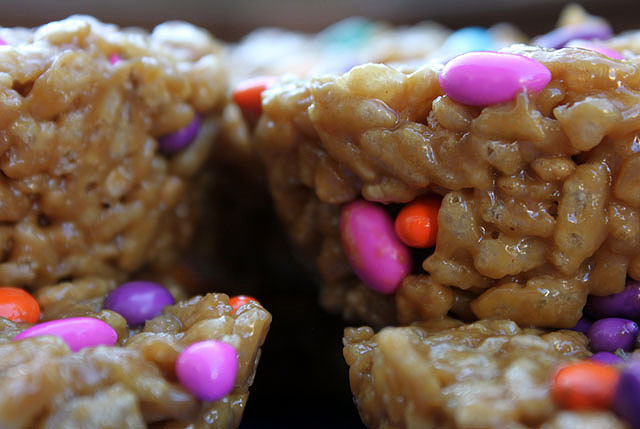 They are easier to make (if that’s possible) than traditional marshmallow crispies, vegan-friendly, and taste a bit like Scotcheroos. Grease muffin tins or pan with butter, oil, or spray. 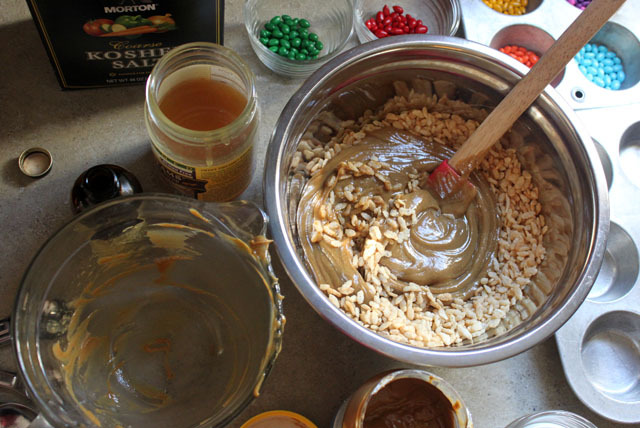 Melt the sunflower butter and brown rice syrup over the stovetop, fire, or in the microwave. Add the vanilla & salt until well combined. Mix in the remaining ingredients and stir until well combined. Press firmly into your pan or muffin cups with a spatula, icy fingers, or greasy spoon. Place the dish in the freezer or on ice for 30 minutes or so. Pop out when ready to eat. 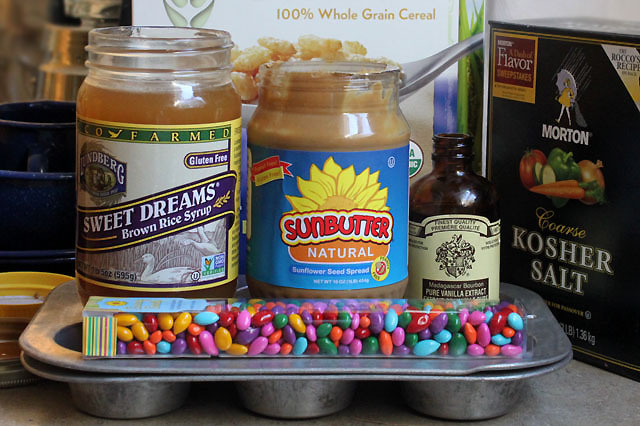 I’ve added this recipe to my list of no-bake sweet treats to make while camping! I’ve never even heard of sunflower seed butter. Totally going to try it! Sounds happy in any case, non? 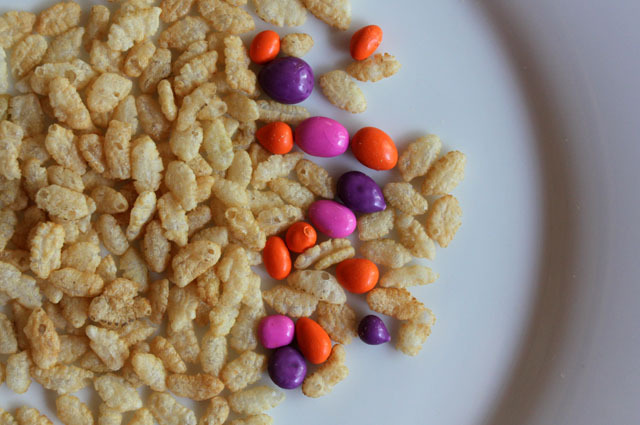 It’s hard to believe, but I like them better than Rice Krispies Marshmallow Treats! Looks so good……I wish I could get sunbutter here, just another thing I need to add to my shopping list when I go back to the states over the summer! Thanks for the recipe! Lovely! No heating up the kitchen? I’m in. This should satisfy the gaggle of kids around our house this summer. 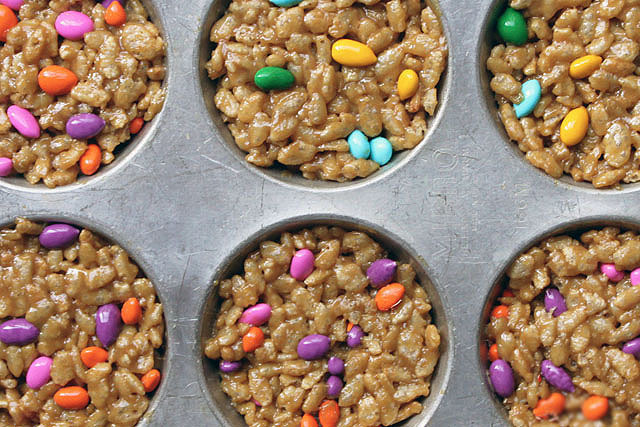 And, as a fellow camper, I can’t wait to make these on our next outing. They’ll look so pretty on the picnic table. Thanks for the inspiration! You’re welcome, Elizabeth! It’s a winning recipe in my book. I hope you and yours enjoy them! aym. you really make me chuckle. (almost drove me nuts). ain’t it the truth. I am a nut-lover… but I guess I am becoming a seed-lover! Love this! Brown rice sugar too! And the home made waffle cones !! will have to try those next! I made these recently (http://sweets.seriouseats.com/2012/06/chocoholic-no-bake-crispy-cornflake-chocolate-peanut-butter-bars.html), and I’m sure you could sub sunflower butter for PB. I also made my own simple syrup instead of using corn syrup. Which is a bonus, because you can use the leftover in mixed drinks. After discovering ginger syrup I started making my own, and it is a tasty mixer, too!